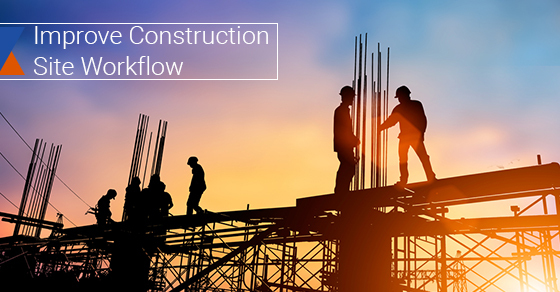 When it comes to the construction industry, the workflow factor is important because it will impact your bottom line for better or for worse. You need the sort of tools and strategies that will help you to optimize construction site workflow so that you can focus on what you do best without having to be concerned with issues relating to materials logistics. The right third-party solution will ensure that your materials are delivered on schedule, are stored in a secure location off-site until you need them and are safely delivered to your site when you require them. Whether you’re working on a hotel project south of the border or a recreational center across town, workflow matters. So read on to learn more about how to improve construction site workflow. You might be surprised at how much benefit you can get by simply making a few prudent changes to how you oversee your project. Keeping on top of workflow at a construction site can become a monumental task if you have to manage one project team, let alone multiple project teams – with each team accountable to stakeholders. While it is technically feasible for different teams to do their own workflow management at the construction site, such a strategy is prone to breakdown. The reason for this is that any mistakes made when different teams do their own workflow management on the same site could result in serious mistakes that lead to anything from cost overruns to increased work to compensate for lost time. So, if there are multiple teams or even if there’s only one one, it’s important that they all work together to ensure that everyone adheres to an agreed upon workflow process. When all parties understand the project scope and complexity, they can complete the project on time and on budget. One way to keep everyone at the construction site on the same page is to use a single platform that can automate management of the project workflow. Using a centralized platform will ensure that all parties know exactly what they are responsible for and will help to keep all parties on track. Nothing clutters a construction site and impedes the work process as much as debris and garbage that is left on the site. In order to avoid this scenario, companies can either hire a third party to take care of the removal and disposal of garbage and debris or do it themselves in a responsible manner. This will definitely improve workflow at a construction site. Garbage and debris can clutter a site – and so can equipment and materials needed for the project. You can improve workflow at your construction site by reaching out to a third party service provider that offers storage and warehousing solutions. With such options, you’ll be able to to keep your equipment and materials in a safe location when they’re not needed. For instance, you might not require certain equipment or materials during the early stages of construction projects, so having somewhere to keep them securely stored until they’re needed will provide precious space and facilitate the orderly accomplishment of the project. When it comes to getting projects done on time, you want equipment and materials delivered to the construction site on time. You can improve workflow at your construction site, therefore, by ensuring that products you need are available as needed. This will save you precious time and allow you to dedicate your energy to completing the construction project on time. Signing up with the right third party will ensure that there are no delays attributable to late deliveries. With the widespread use of mobile devices such as smartphone and tablets, you can benefit by incorporating this sort of technology into your plans. For instance, project managers could use their mobile devices to find information relating to, among other things, contract information, project milestones and project updates. Essentially, any member of your team could use mobile devices logged into the cloud to more efficiently carry out their respective duties. You can definitely improve workflow at construction sites with the above tips. Anything that impedes workflow can delay projects, which in turn can lead to unexpected additional expenses that you might have to shoulder. There are many things that can go wrong if you don’t plan accordingly – that’s why third-party logistics is crucial to construction site workflow. You’ll be able to focus on your core competencies while the third party helps to ensure nothing slips through the cracks. So put the aforementioned recommendations into practice, and you’ll be able to improve workflow and complete your construction projects.